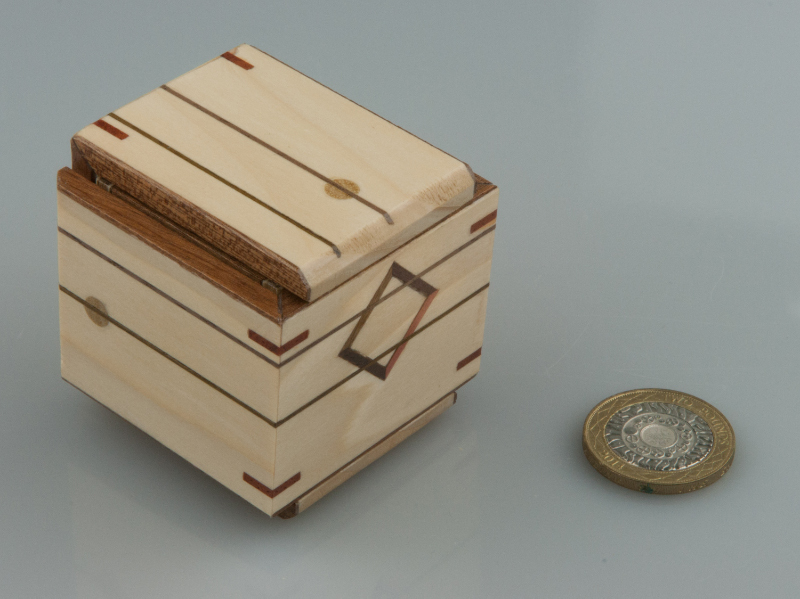 KOPA, or KO Box has been my go-to puzzle for inflicting on random puzzlers for a good few months now – it has a great balance between looking innocuous and managing to convince you it’s totally impossible… and pretty much everyone who’s solved it, absolutely loves it! 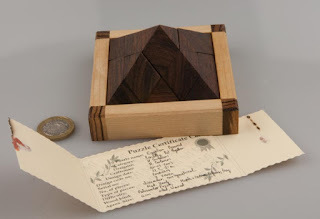 Takeyuki Endo makes fabulous looking puzzles – quite often lavished with superb decoration for no reason other than to make them look pretty, REALLY pretty! 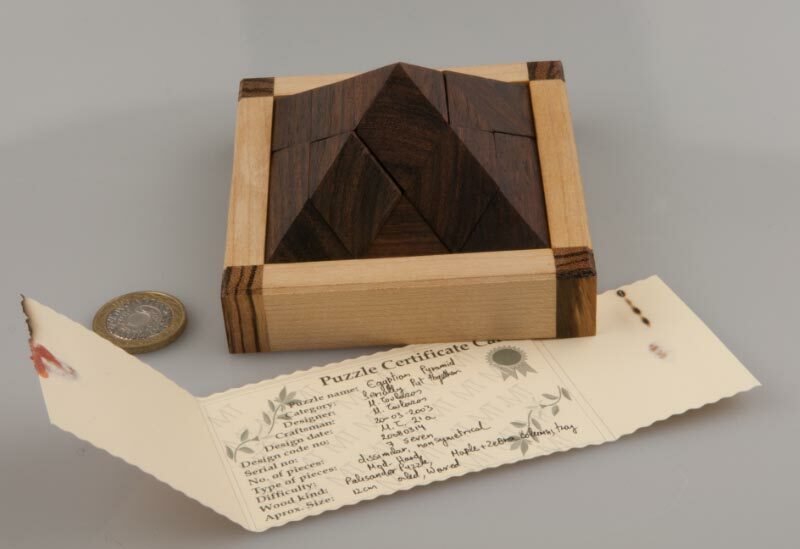 His puzzles generally have a bit of a twist, or several challenges… KOPA is a simple, single challenge puzzle: assemble the box, with a little drawer-piece in the centre – that is all. 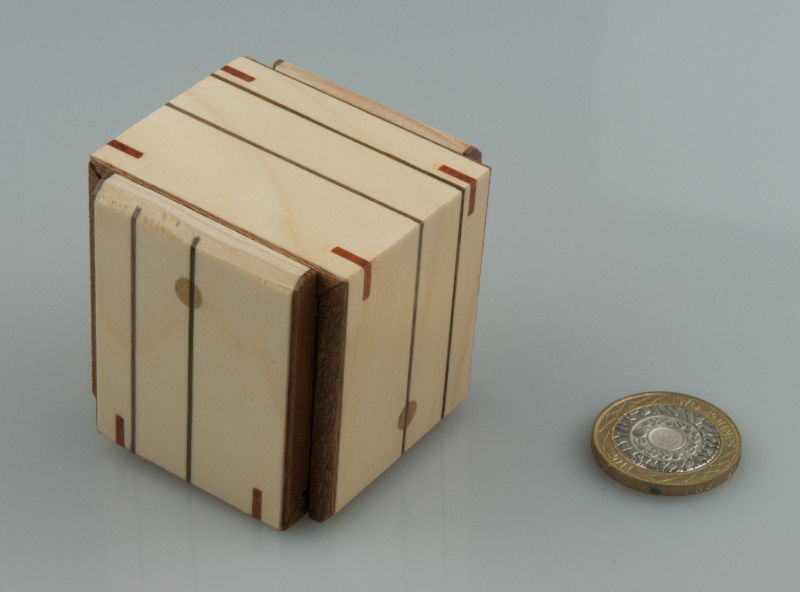 There are three pieces making up the box, and one more piece to go into the centre… two of those box-pieces are permanently joined (back right in the picture above), and one piece can be introduced and removed at will while the central drawer-piece (front, centre) isn’t in play… The movements are governed by tracks and dowels in the respective pieces – and the whole thing ends up working a bit like a universal joint. That central drawer-piece is symmetrical and can go into the middle box-piece a few different ways – with exactly the same result… there’s no funny business in there, it really is as honest as it looks. Inserting the drawer restricts the movement of the final piece to the extent that you can almost close the whole she-bang up neat and tidy, but not quite. And therein lies the puzzlement. 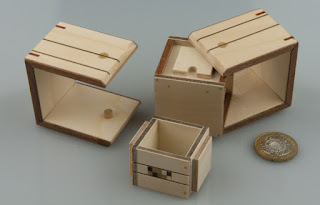 Without that drawer-piece, assembly is trivial. With that drawer-piece, you’ll easily convince yourself that it is thoroughly impossible. …from there through to final solution has a somewhat wider distribution! 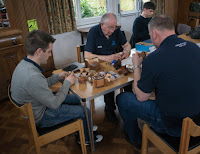 Everyone agrees it’s a superb puzzle! 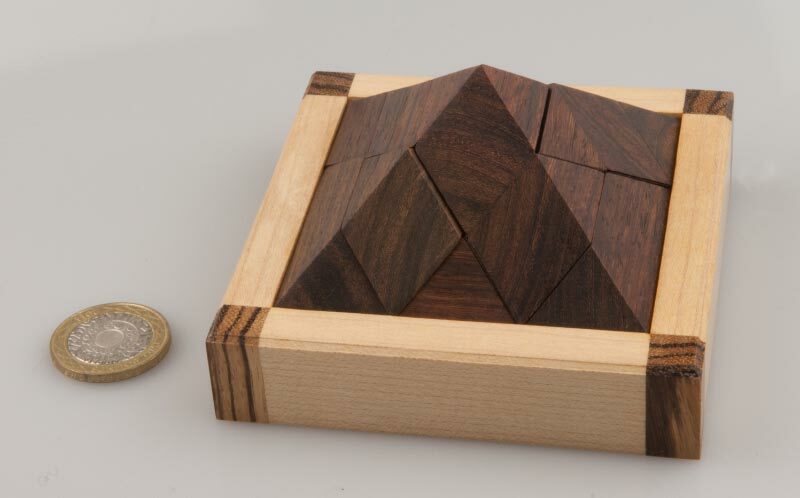 I find I generally really like Endo-san’s puzzles – but this one became a favourite after Big-Steve spotted it on Torito’s website and ordered us a few… I’m very glad that he happened upon it and thought of me when he was ordering one… Thanks mate! OK. So I’m a bit of a Mike Toulouzas fanboy… and I’m fine with that… because he makes pretty darn awesome puzzles. 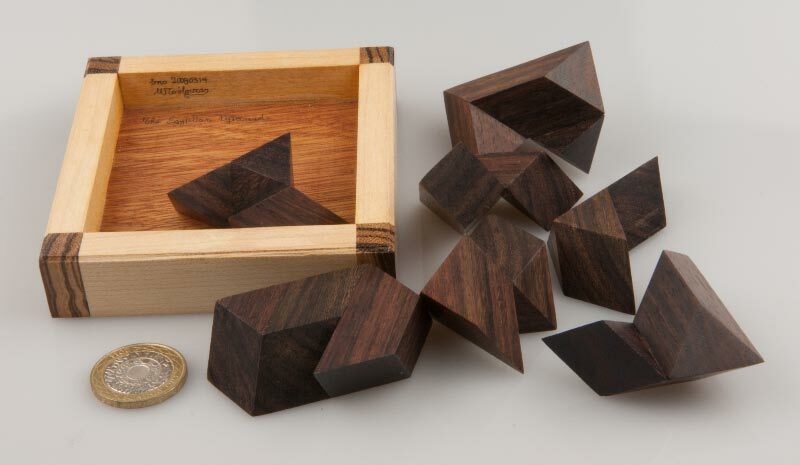 If you’ve been reading this blog for any period at all, you’ll already know that… and you’ll know that when I get the chance to buy one of Mike’s puzzles that I don’t already have, I generally jump at the opportunity… last October I jumped, again – and acquired a lovely copy of Mike’s Egyptian Pyramid. This copy came from John Moores’ personal collection and I suspect strongly that it was one of the copies used as one of Mike’s entries in the 2004 Puzzle Design Competition – it looks remarkably like Nick’s picture of the entry - and Mike didn’t make very many of them. Anyhow, enough of this fanboy stuff and tell us about the puzzle, eh? Jacques shipped it assembled (he’s a nice man!) but suggested that when it arrived I should tip the pieces out and have a go at assembly… and then he warned me that it was a properly hard puzzle. You have seven rather odd shapes which until a few seconds ago looked quite orderly in the shape of a pyramid… now they just look like seven oddly-shaped pieces. Start experimenting and one piece announces itself as needing to go in a particular (albeit generic) position – and then one or two others will go together in a pleasing manner… and you can start making some progress. 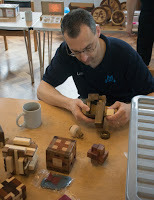 You’re left in no doubt that the pieces are seriously interlocking – nothing just rests in place – everything interlocks with something… assembly doesn’t get trivial until the very last piece – it’s a lovely dissection that seriously challenged my spatial perception – those angles are just weird! 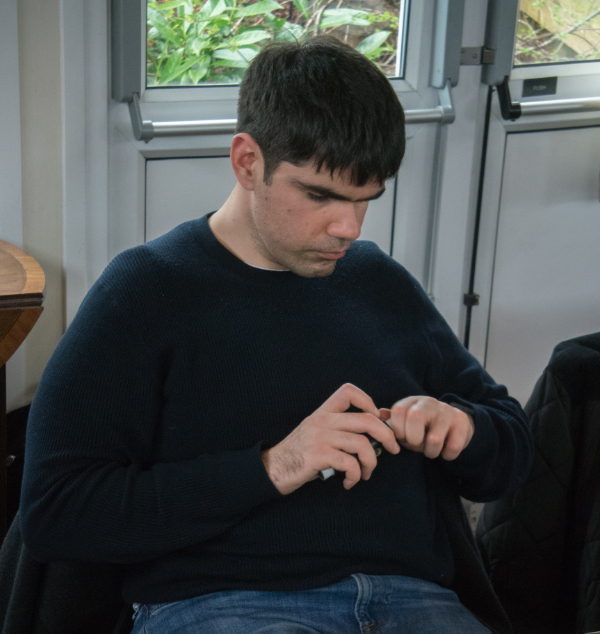 Over the last few months I’ve foisted it on a number of puzzlers – mostly with success after a little puzzling (generally a lot less than it took me!) – and invariably with smiles and kind words about an excellent design – (another!) great design, Mike! Once again on a Friday evening I find myself collecting a few Dutch puzzlers from BHX… except this time there are three of them: Rob’s spent the day sight-seeing around Brum (basically sampling craft beers and buying a few bottles – “for a friend”) and meets us at the airport when Louis and Wil arrive from Schipol. Back at home I make a round of coffees and, not unsurprisingly, we start puzzling. I get to have a rake through Wil’s crates and manage to score a copy of Tube It In for a friend and a few of JCC’s latest creations that haven’t made it into my collection yet. Wil gives me a prototype hyper dexterity challenge consisting of an angel dangling from a hook on a chain inside a Kikkoman bottle – the aim is to dangle a necklace around the angel’s neck… I can only picture the angel coming unhooked and NEVER going back on the hook again! Louis presents me with a 3D-printed (his new toy!) ambiguous object that either looks like six round pipes or eight diamond shaped pipes – I haven't seen that one before and it's rather trippy! Thanks Louis! Some time after midnight, wondering how the heck they’re still so wide awake when they’re supposed to be an hour ahead of me, I head to bed, leaving them happily chatting and playing in the puzzle cave. It doesn’t take long for the gang to gather – although Big Steve seems to be registering a protest vote: he’s brought along a bunch of jigsaw puzzles and his new (but growing!) collection of tongue depressors. Actually I do the man a great disservice: the jigsaw puzzles are awesome pieces of art from Mike & Gill Hayduk – must order some of those soon! …the tongue depressors, well that’s another story entirely. 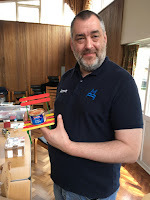 Since I last mentioned them in the MPP XXXi write-up, things have gone a little downhill on the tongue depressor front… and for the benefit of those of you who haven’t followed Steve’s social media cries for help, here’s a potted summary: first of all, someone sent Steve a bunch of tongue depressors in an envelope with no discernible postmark – this confused Steve. Then he started receiving random parcels, some from Amazon with no apparent way to identify the gift-giver (yes, you really can give a gift through Amazon absolutely anonymously, just in case you were wondering!) 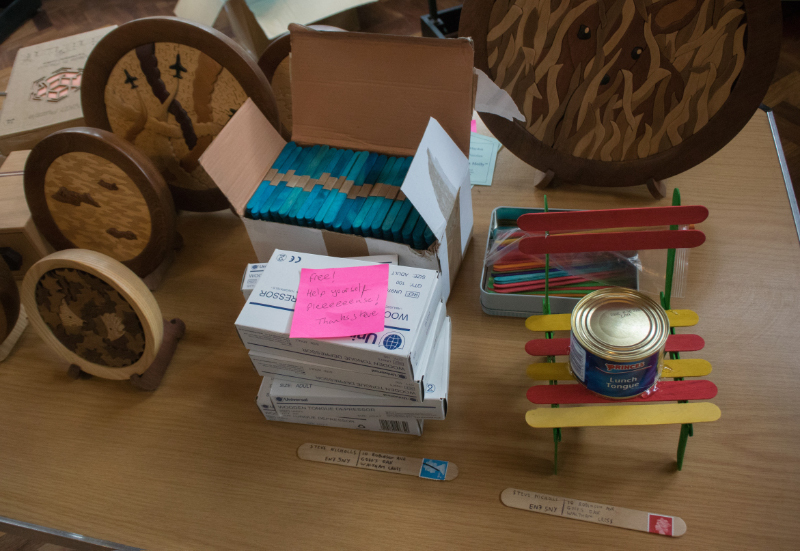 and some from anonymous well-wishers, there were large quantities of coloured dowels (technically not tongue depressors, but close enough! ), coloured popsicle sticks (ditto, but even closer!) and even a work of art (postmarked RAGUPON? ): a Tongue lifting device crafted purely of painted tongue depressors – real vintage Blue Peter stuff! Somewhere in there a couple of hilarious videos popped up with helpful suggestions and encouragement… things may just get a bit silly! But even after all that, the pièce de résistance, a pair of tongue depressors arrive through Royal Mail with just Steve’s address and a stamp on each of them… pure-dead-brilliant! 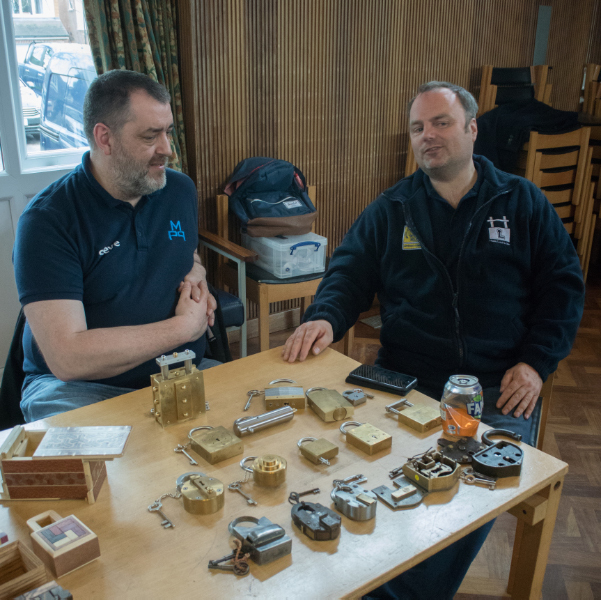 …not only had Steve brought along these wonderful artefacts (making a promising collection, don’t ya know?!) he also brought along several boxes of tongue depressors to give away… and a couple of tongue-depressor-art sculptures (some assembly required) to give away – and we ended up playing pass the parcel with them, hiding them in one another’s crates in the hopes of avoiding them – in the end Ali and I ended up the winners…! We had a new guy called Ed join us for the day – Ali collected him from the station and we had him sat down and puzzling with us pretty soon after he’d arrived – he wanted to feel some Karakuri boxes so we’d brought a selection along for him to have a go on… generally he knocked them off pretty quickly and told us how simple he was finding them… Ali passed him a Super-Cubi and that kept him quiet for a little while – but he got it open and closed again fairly efficiently, pausing halfway to run a finger around the mechanism inside and express some awe and wonder at the engineering – you see, he’s totally unsighted – and a pretty darn good puzzler! 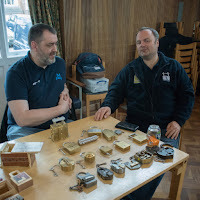 Shane had brought along a small number of vintage locks and his full collection of Popplocks, just in case anyone wanted a bash at one they didn’t have themselves…! 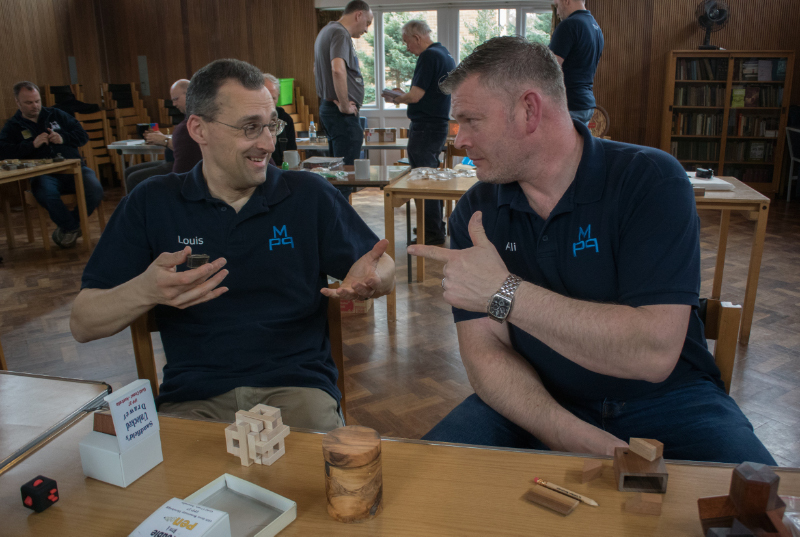 Rich Gain had brought along some 3D printed copies of his recent designs and I managed to grab a copy of his Coronation Cube and Printable Interlocking Cube #3 (I think – someone will correct me if I’ve got that wrong!) 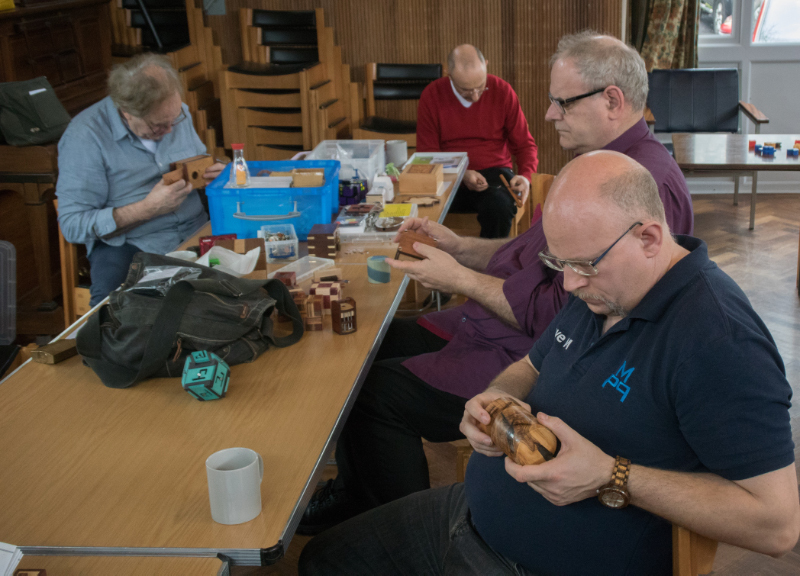 – I had a great time fiddling with those on the Sunday evening after all my puzzling guests had left… they’re definitely worth a look. Wil did a reasonably steady business all day and his bags weighed a lot less on the way home than on the way over. As usual he had everything out for people to play with and it’s interesting to see how some people decide to buy a puzzle: some solve it and decide “That’s brilliant, I have to have one” and others don’t quite manage to solve it and decide they need to take one away and solve it at home… we’re a pretty strange bunch, but we all manage to justify our purchases somehow! … in fact it remained unsolved by the gang until the following day when Rob managed to solve it around lunch time… Well done Rob! 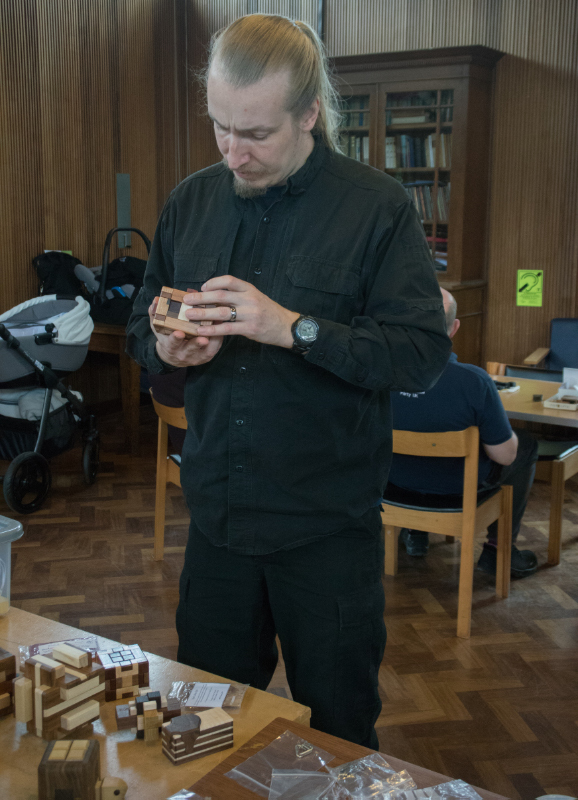 Everyone who played with my new copy of Coffin’s Hexagonal Prism absolutely loved it… everyone managed to assemble it and all seemed to enjoy playing with it… it is an absolute delight! 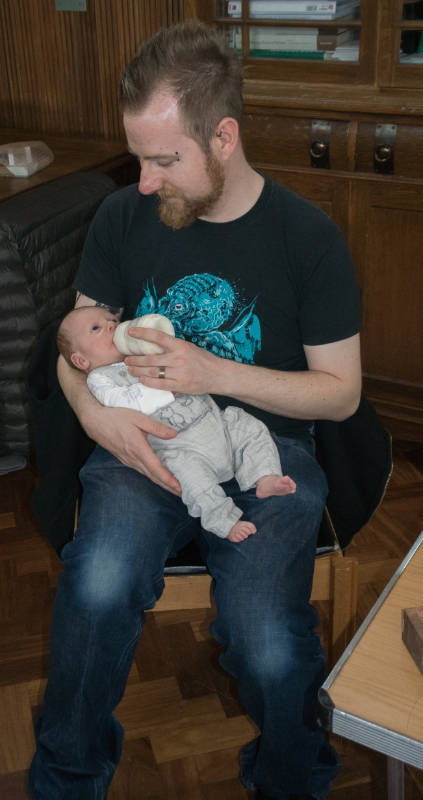 We had a surprise visit from our youngest MPP member in the form of Oren – aged 5 weeks – he’d thoughtfully brought parents Adin and Sophie along knowing they enjoyed a bit of puzzling! 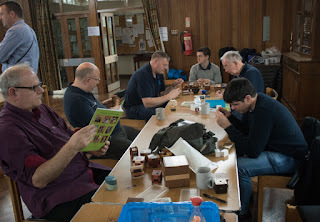 Somewhere after 5 o’clock we all decamped back to my place for the traditional fish supper, where there was a fair amount of really good banter and some dinner, and puzzles, of course. Sunday morning was complete with the traditional Coolen-Puzzle-Solving-Service, sorting out a couple of pesky little blighters for me, before I dropped him and Wil off at BHX for their flight home… followed by more puzzling and some lunch before Rob was safely deposited there for his flight home… and another fine MPP weekend draws to a close.